Camping Siena Colleverde i Siena, Italien: Reservér nu! The balance has to be settled at least 3 weeks before the date of arrival and in case of reduction in numbers, no show or cancellation the balance is not refundable. Only the city tax has to be paid directly in the camp site. Camping Siena Colleverde is the Campsite in Siena and is in a great location. We are 1km from the train station, and only 2.5km from the Historical Centre. Not only is it so close to the City Centre, but it also has a great view of the city, and just behind it are the Chianti hills, a great place to relax! 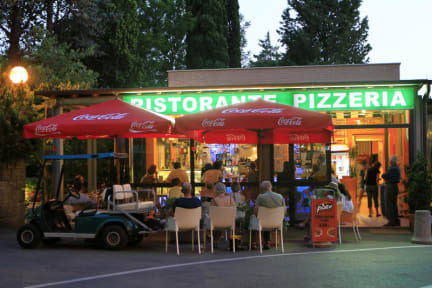 Camping Siena Colleverde has been completely renovated in 2008, so on site you will find a brand-new bar, pizzeria / restaurant (open from 23/03 till 31/10) , market, WiFi area, laundry facilities and swimming pool (open from 01 June till 15 September weather allowing) with a small pool bar. Also the little towns of Montalcino, Montepulciano, Monteriggioni, San Gimignano are only a few kilometers away. To reach the city centre there is a bus that stops directly in front of the Campsite. It is a public service and runs every half hour until midnight. But you can also walk as we are so close to the city Centre! !